In a large bowl, mix thoroughly together oats, almonds, pecans, ground flaxseeds, and cinnamon. Set aside. In a medium bowl whisk egg whites and salt until the whites are frothy for 3-5 minutes. Mix the canola oil and honey into the egg whites. Pour the egg mixture over the oat mixture and combine completely. Spread granola out on 2 cookie sheet pans. Bake 15-20 minutes on upper rack. Stir granola half way through and switch pans. 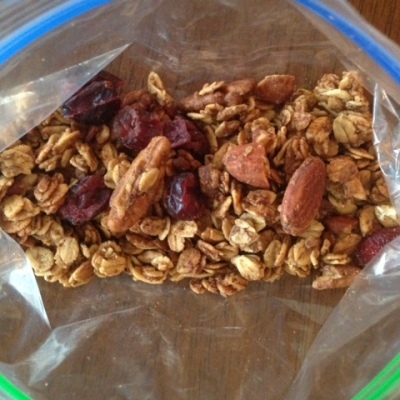 Bake another 10 minutes until granola is crispy and golden brown. Remove from oven and let cool. Store in an airtight container up to two weeks at room temperature or 3 months in freezer.